An easy forest walk to a picnic area on the eastern side of Wellington Harbour. Butterfly Creek • By Matthew. Licence: cc by-nc-sa. Several easy routes lead into Butterfly Creek Picnic Area from Eastbourne. The loop described here uses two of them, but there are also tracks leading up from near Burdans Gate to the south or Muritai Road. Eastbourne is a short drive from Wellington, or you can take the ferry from Queen's Wharf to Day's Bay. Walk south to Muritai Road, then turn onto Mackenzie Street. The track climbs the hillside on the left. The Mackenzie Track climbs through manuka scrub and scattered beech trees, soon giving good views across the harbour. Pass the junction with the Main Ridge Track leading north and the Muritai Track leading back to Eastbourne. 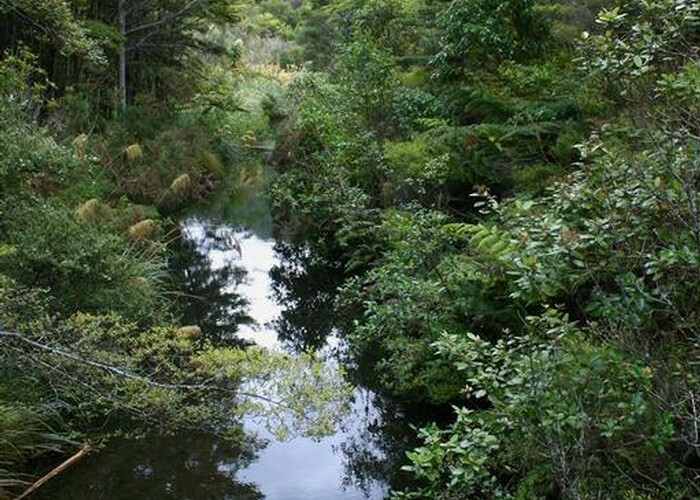 Drop down the hillside through silver fern and beech forest into the Butterfly Creek valley and meander in the cool forest along the creek. Pass the track leading back to Kowhai Street, and the picnic area is nearby. Tables and a toilet here. Return to the Kowhai Street track and climb over the easy ridge past the Bus Barn Track. Drop down through pohutukawa / manuka forest with pretty rengarenga lilies at the trackside. Soon you come out onto Kowhai Street. Walk down to the end and take Muritai Road north. Added 11 December 2010 by MatthewMatthew. 1 revision 11 December 2010 by MatthewMatthew. 428 views in the past year (36 per month).